Please visit our smile gallery to view the treatment we have provided on our patients. “Having researched one or two dental clinics regarding a complete set of implants in my upper jaw I chose to go to Dr Patel. It proved to be an excellent choice, the technical expertise shown could not have been bettered. Dr Patel is both experienced and an enthusiast so that the procedure proposed was explained and discussed, and any questions I might ask were answered very patiently. I was assured that I would experience no pain and this proved to be the case – I felt nothing, this from a man who has suffered with previous dentists. 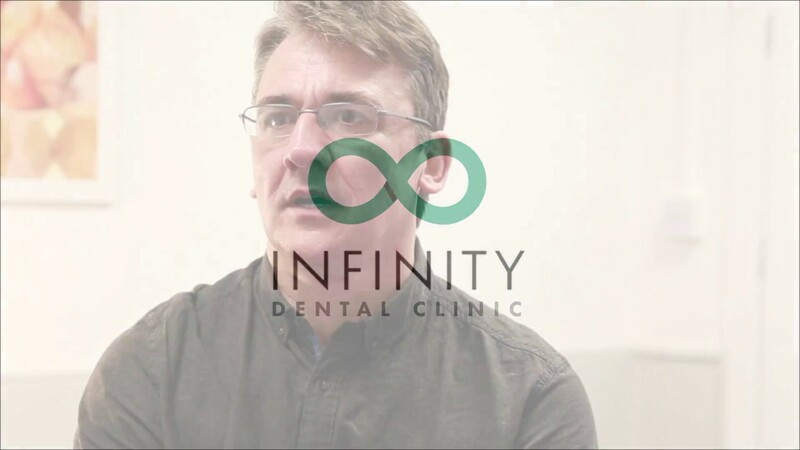 “I would just like to say a massive thank you to everyone at Infinity Dental care following my recent tooth implant treatment. From the initial consultation where everything was explained clearly to the treatment itself everything went smoothly. Everyone on the team from the dental nurses, Jasmine the treatment co-ordinator & Dr Patel were really friendly & professional throughout. I was always re-assured about anything I felt nervous about throughout the whole treatment. Dr Patel is exceptional at what he does & there’s not much (if anything) he doesn’t know about teeth. He has a very calm manor which immediately puts you at ease. My implant looks fantastic & I cannot recommend them highly enough. “I have been under Hannah’s care for 18 months and received Botox treatments for my forehead lines and crows feet, as well as fillers for the loss of volume under my eyes. Hannah is an excellent listener and genuinely cares with no hint of bias or cookie-cutter logic. She has always been easy to connect with when needed. “I found Dr Mohsin Patel very professional and conscientious. He was always available to speak to during a challenging course of treatment. He has a very pleasing manner and is very knowledgeable, which gave me confidence in his abilities. He also went to extra lengths to ensure my treatment was finished before a very special holiday. The end result is lovely, he gave me my smile back, the team are very friendly and professional, the surgery is bright clean well equipped and up to date. “I hadn’t been to the dentist for several years and was very nervous about my appointment. As soon as I walked through the door, I was welcomed by the lovely staff and felt immediately at ease, albeit still a bit nervous. I was called into the surgery by Dr Patel and was put at ease by his smiling face, his patience and his understanding. During my consultation, he explained fully what he was going to do and examined my mouth with care. Following that first appointment, it became evident that I needed quite a lot of work carried out on my teeth. Since then I have had regular (fortnightly at times) appointments and a lot of work carried out (perio, orthodontic work, impressions). Throughout my treatment, Dr Patel has always been professional, displaying a calm and considerate attitude to all he does. At one point, I received some bad news about my teeth and Dr Patel remained dedicated and consulted with other orthodontists to understand the problem in more detail. He then explained the process to me in great detail and answered my many questions with the same dedication and professionalism as always. Now, almost a year on, I am so pleased I walked through the doors and had my dentistry carried out by Dr Patel. I now have an amazing smile and straight white teeth, all down to Dr Patel. I trust his work completely and am never nervous during my appointments anymore. “Having broken a front tooth & told it would have to be taken out, I was as you can imagine in a bit of a quandary, not knowing how to proceed. I was shown a number of options & took the decision to have an implant fitted. Dr.Patel talked me through the procedure & gave me literature with everything listed how to prepare & how he was going to carry it out, with leaflets with examples of past procedures. During the long procedure to fit the implant, Dr Patel kept me informed all the time, asking about my welfare, as was the case during the healing period when I would receive a `phone call & also pay regular visits, to the Surgery to check on my condition. “As an over 50’s patient with not-so-good teeth, from the moment I had my first appointment with Dr. Wilson, I was impressed with her listening, then with her assessment of the treatment options available to me, including their longevity and durability risks. Subsequent root canal, crown and wisdom tooth removal were performed skilfully and with great re-assurance and communication during the treatments. Dr Wilson has my complete trust; I am that pleased and confident in my teeth. “I had never been happy with my smile and I thought nothing could ever be done about it. Dr Patel promised to give me ‘the smile’ and he certainly did an exceptional job!